The C-SSRS and Safety Planning Intervention are now widely recognized as a gold-standard, innovative suicide risk screening tool and brief intervention. Due to its demonstrated ability to identify high risk individuals and guidance for next steps the C-SSRS positively impacts service utilization through decreasing unnecessary interventions, redirecting scarce resources, and expediting care delivery to those at highest risk. This workshop will review the C-SSRS and its administration, covering its items indicating increased risk. Participants will learn how to administer the full and screening versions of the tool, how to customize the tool and how to interpret results. Population-specific editions will be reviewed (pediatric, military, etc.). System-wide implementation across multiple settings will be discussed. At completion, participants will be able to administer the C-SSRS and Safety Plan Intervention and will receive a certificate of learning. Describe the epidemiology of worldwide, national and local suicide. Discuss common myths about suicide prevention. Explain how preventative screening models and brief interventions can be used to identify and support at-risk individuals and establish care plans that allocate resources effectively. Describe the evidence base and how utilizing a systemic best practice measurement, the C-SSRS, to identify suicidal ideation and behavior results in improved safety monitoring, identification, and precision. Administer the C-SSRS full and screen scales and identify other tools in the C-SSRS toolkit. Demonstrate how the C-SSRS impacts care through operationalized criteria for next steps which in turn streamlines triage, redirects scarce resources, and facilitates care delivery to those at highest risk. Define and explain the purpose of brief interventions for suicide. Create a safety plan with a client at risk for suicide. Program Sophistication: Introductory – No prior knowledge of the specific topic is required. Presenters do not have commercial support and/ or conflict for interest for this program; they will not personally benefit from program. Presenter is an employee of Columbia University, the sponsor of the C-SSRS Scale, the Scale is free and available to anyone interested. This workshop is sponsored by NJPA. 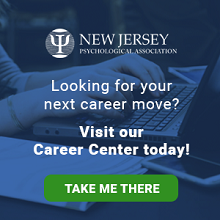 NJPA is approved by the American Psychological Association to offer continuing education for psychologists. NJPA maintains responsibility for this program and its contents. Americans with Disabilities Act: accommodations are available upon request. Requests must be made at least 14 days prior to the event. Please contact Ana DeMeo at [email protected] for more details. Registration Policies: On–Site Registration fees will increase by $20. Refunds less a $25 administrative fee will be granted until April 12, 2019. No refunds after April 12, 2019.